New computer and communications technologies have acted as the catalyst for a revolution in the way goods are produced and services delivered, leading to profound changes in the way work is organized and the way jobs are designed. This important book examines the nature, setting and impact of new technologies on work, organization and management. Conventional debates about new technology often invoke optimistic visions of enhanced democracy, rising skills and economic abundance; others predict darker scenarios such as the destruction of jobs through labour-eliminating devices. This book proposes an alternative perspective, arguing that technology can be powerful, but in and of itself has no independent causal powers. It considers the impact of new technologies on manufacturing, clerical, administrative and call centre employment, in both managerial and professional arenas, and introduces the growing phenomena of telework. The book also assesses the important political and economic forces that restrict or facilitate the flow of new technologies on national and global levels. 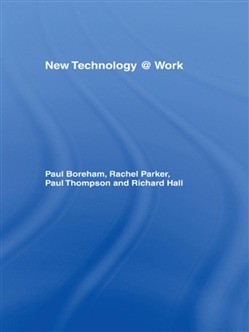 New Technology @ Work is an illuminating and thought-provoking text that will prove invaluable to all serious students of business, management and technology. Acquista New Technology @ Work in Epub: dopo aver letto l’ebook New Technology @ Work di Paul Thompson, Richard Hall, Paul Boreham... ti invitiamo a lasciarci una Recensione qui sotto: sarà utile agli utenti che non abbiano ancora letto questo libro e che vogliano avere delle opinioni altrui. L’opinione su di un libro è molto soggettiva e per questo leggere eventuali recensioni negative non ci dovrà frenare dall’acquisto, anzi dovrà spingerci ad acquistare il libro in fretta per poter dire la nostra ed eventualmente smentire quanto commentato da altri, contribuendo ad arricchire più possibile i commenti e dare sempre più spunti di confronto al pubblico online.